These are general purpose, standard 3-prong power extension cables useful in all sorts of applications. The length of these cords is just right for those situations where you need just a few more feet of length. Keep a few spares around for when you are in a tight spot. The very short cords work well as 'outlet savers' when plugging in 'wall wart' power supplies. These power supplies often take up the space of two or three outlets on a power strip. 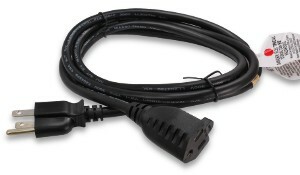 Using the short extension cords allows the power supply to be a short distance from the power strip, thus freeing up the adjacent outlets for other devices. These power cords are constructed from 16AWG wire.